Dryden High School Online – Page 439 – Building a culture of learning. Sept. 21 Everyone is invited to attend our school’s first SAVE meeting of the school year. If you are interested in helping us keep our school violence free, please come to a meeting in the library on Tues. Sept. 22 at 3:30. Hope to see your there! Sept. 21 Strange as it sounds, the football team played better in week 2 than in week one, but fell to the West Kildonan team 28 – 7. The Eagles look to put all the pieces together this Friday at homecoming vs. St. Johns. It was a busy weekend for Eagles Athletes, with the Football team traveling to Winnipeg, Junior and Senior Volleyball in Kenora for tournament play and the Senior Girls Basketball team in Thunder Bay for a tournament. The football team was unable to hold back the West Kildonan Wolverines as they fell 24-7. Jake Berry brought in the lone Eagles touchdown. The team is seeing steady improvement and should put on a good show at this Friday’s homecoming game. In basketball, the Senior Girls won their first and then dropped the next two for an eventual 7th place finish overall. In volleyball, the Senior Boys finished up in the quarter finals against Portage la Praire in a very exciting 3 set match. They played well and will continue to improve as the season goes forward. They ended the weekend with a 3 and 2 record and a tie for fifth place overall. The Junior Boys team was split, with the grade 9 team placing 4th. 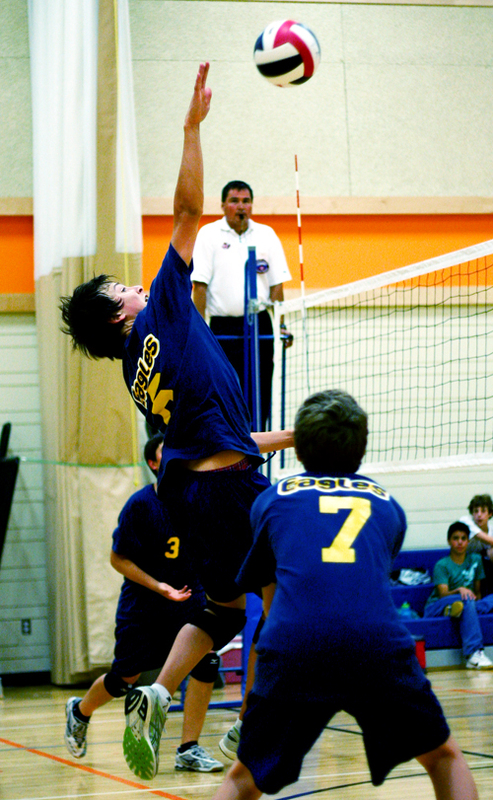 The grade 10 team placed 2nd overall, losing in the championship round in three sets. Congratulations to all Eagles athletes for their outstanding effort! This week the Eagles court sport teams kick off regular season play Tuesday against the Fort Frances Muskies. Games start at Noon and continue all afternoon. Drop into the large or small gyms to cheer on your Eagles. The football homecoming game is this Friday vs. the St. Johns Tigers. Come out and pack the stands with blue and gold for what is sure to be an exciting homecoming game. Thanks to Mr. Paul Darling and his players for snapping the pics at the volleyball tournament.